The new update and "Plus" have brought a bevy of new issues to the Steam version. People have experienced blurry full-screen visuals, black and white opening and ending animated cutscenes, game slowdown after using Time Trial mode, more frequent crashing, etc. I've been holding off on playing the PC version (have just been playing my PS4 and Switch versions) until more patches come out/issues are resolved. But it looks like the easiest way to fix the blurry full-screen visuals and black and white opening and ending cutscenes is to go to Computer>C:>Program Files (x86)>Steam>steamapps>common>Sonic Mania>Settings, and double-click/open the Settings file. That will open the file in Notepad and have a bunch of text related to your "Sonic Mania" configuration settings. At the top under [Video] the thirteenth line will say "shaderSupport=n." Just change the n to a y, and click save when you exit the window. There's been at least four confirmed instances of music cutting out in Encore. (I'm assuming if I watched all the streams that are currently available on Youtube/Twitch I'd find several more.) It happens twice in this video on Youtube here and here, it happened to Blue Blood here, and it happened to BlazeHedgehog here. - The rocks in Lava Reef still look like penises. Also spamming it increases your mach bonus as well so you can reach overall bonus like this. An accidental dev/debug leftover, I think. The game seems to crash as Mighty if you do his move after the signpost falls down in Titanic Monarch Act 1. Anyone else experienced this bug? I noticed something fun last night that I'm not sure has been mentioned yet. In Encore mode, when underwater in Hydrocity, you can cheat death from drowning by swapping characters. It may not help much depending on who got a bubble last, but it did save me at least once. I ended up falling straight through a flipper, too. I think I've been hit with a bizarre bug in Time Attack mode on the Switch version: all of my Replays appear to have vanished, but the game tells me that I have "insufficient replay space" and asks me to delete old replays if I try to save a new one. I can't delete them individually, though, since the Replay menu insists they don't exist: I seem to be left with no choice but to use the Data menu to wipe them all. If I select a time with a replay attached while selecting an act to play, the game opens an invisible menu and lets me move between options, but no options do anything, preventing me from watching, challenging, or deleting a replay from within this menu too. I'm wondering if there's some sort of issue where the supposed maximum amount of replays and the point at which the game tells you that you've hit that maximum aren't the same value, or if a value passed to the Replay menu overflowed. Needless to say, this has stopped my speedrun attempts dead in their tracks. Not too much to say in this section, however:- I watched the full credits roll after the first Mania mode run, and it had specific credits for Switch, but not for PC, PS4 or XB1. Not sure if that's really an issue, but it's odd to have credits that look like they were meant for a different version of the game. - Hammer drop messes with layering in those MMZ2 sections where you can walk in front of the wall or behind it. I hammerdropped a Monitor that was already on the ground to a lower place because of the layering trick, which made said monitor unreachable. - Hammerdropped in mania mode after beating red eye, more specifically when the signpost was falling, and the game crashed. - I suffered the black and white ending on the first 3 runs through Mania mode, never again after that, and the opening was colourful the only time I watched it. - Many sound halts, it's obvious the code to handle the track switching was modified but not properly enough to avoid any kind of issue. - Loading the game now takes ages. I haven't tested if there are any other performance issues. 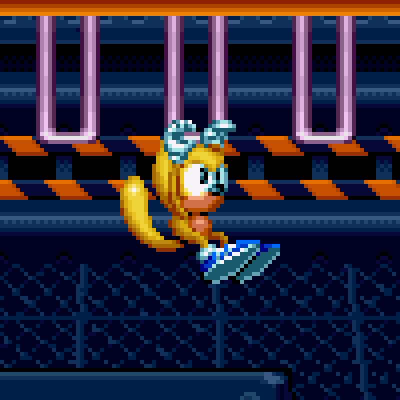 There are a couple of new glitches present, some of the new transitions are kinda buggy (if you hold right after the hang glider scene in Press garden you start pushing for some reason, if you fly up and stand on top of the capsule in Hydrocity Act 2 as Tails you get some strange movements as a result, although the movement throughout that whole scene is strange), there are still music bugs, Mighty's Super Palette is broken (one of his skin tones turns dark brown when going Super for some reason. A PC mod has already fixed this but that shouldn't have to be the case) and his Mean Bean machine sprites are just weird looking, your partner's movements through the Oil Ocean cannon things are kinda weird (they can drift off to the side occasionally or just be launched on a totally different trajectory), and of course we can't forget the plethora of broken things on the PC version thanks to the DRM they insisted on slapping on the game. Did anybody else get a moonwalking Ray in the transition between Press Garden 1 and 2? Go as far right as possible and face left during the transition. It's a lovely bug they never fixed. Did encounter a bizarre minor bug today, though - did a Press Garden Act 2 (Encore) run with Ray, challenging a replay I'd saved previously. Managed to beat my ghost, but at some point it seems my ghost started to display as Sonic rather than Ray! Not sure exactly when - I only noticed it after reviewing the score tally, at which point the ghost was frozen in an ice block and caroming down the final hill towards the goal. Did managed to get a screenshot just as he sped past the goalpost, though - very strange! Anyway, has anyone come across this yet? It's what happens after you fall from the flipping platforms above nearby. Playing with most of those cheats on I found you can actually make characters other than Sonic do the super peel out move....sometimes. They just play their fastest run animation when doing it but worked for every character so long as you had forced encore and max moves on. The other condition is that each character must have been Sonic at some point to use the peel out. So while I've enjoyed most everything about all the new stuff Plus added, I'm not really that much of a fan of the Metal Sonic Kai fight, and I think I know why. My main problem is that, if you hit him from the left, you're pretty much doomed to fall in the pit. I think it's because that, unlike other bosses that force you to move in one direction like MHZ2, the Death Egg Robot in GHZ1 and the other Death Egg Robot in DEZ2, you don't get launched to the direction of safety. If they can patch that in somehow, I think the fight would be better off for it. The only new problem I've encountered is the apparent loss of DS4 compatibility. Quick question - in Time Attack mode, is 14 saved replays the absolute max you can have? I was having a lot of fun going through and trying to record my best times on each stage so I could challenge them later; challenged and beat a replay I already saved but was told I had insufficient space for more replays at the end of it, so wasn't able to save my run. Unless I'm missing something, there was no option to delete another replay to allow me to save that one, either - bit of a shame, as I'd have simply deleted the run I'd originally challenged otherwise! does the Mania update add the Plus menus? the new menu is part of the update, not the DLC. So theres no going back. -Mania Mode allows to play as Mighty or Ray, but the four additional slots that would be required for their two saves haven't been added. Bummer. This is a real shame! I had 8 perfect save slots of Emerald and non-Emerald playthroughs on my Mania save. Guess it's not so essential now that Super transformation is a seperate button though so I can hopefully live with sacrificing a save slot or two..
Something that all three bonus stages in S3&K had in common was a form of 'time limit' imposed by the stage design - the gumball bumpers breaking, the slot machine wall tiles becoming 'goal' tiles, and the rising beam in the magnetic ball stage. The new pinball bonus stage has nothing like this, and without that element of tension gets dull quite quickly. I started a Mania save as Ray, entered a pinball stage in GHZ1 and went from 6 lives to 24, also earning five continues. The only reason I left was because I was bored, otherwise I don't see a reason I couldn't have continued indefinitely. Now, I love the pinball bonus but at the same time it feels rushed and jank, the flippers don't launch you correctly and physics are out of the window, for a game designed around rolling about you would think the pinball table would feel good like the bonuses in Spinball but they really don't here. - You can't get the Pinball Bonus Stage in Mania Mode until you get a perfect on all of the Blue Spheres stages. I can definitely get all of the Silver Medallions, but I'm too much of a scrub to get the Gold Medallions. While I'm all for there being some kind of reward now for getting all Gold (unless there was prior, and I'm forgetting), but I feel like a Bonus Stage where you can acquire rings, power ups, lives, and continues should have been the default. There's a "get all Gold Medallions" mod out there already, right? - No multiplayer during Encore mode, and still no online multiplayer, is disappointing. Online co-op still feels to me like an incredibly natural place for the series to go. - When we learned that there were seven new Special Stages, I foolishly got my hopes up for Super Emeralds and Hyper Sonic. One thing that somewhat seems to bother me is that they still didn't bother to give Egg Reverie Zone its own level select icon in this, it's still the Death Egg icon. They made an icon for the pinball stage, so why did they not bother with ERZ? Both [Ray] and Mighty are weirdly desaturated compared to Sonic, Tails, and Knuckles. The biggest signifier of this is that all five of the characters have six shades for their base fur/shell colors, and for Sonic, Tails, and Knuckles, the bottom three shades are all at max saturation. Mighty and Ray's, on the other hand, are about 30-40% less saturated, and that alone makes them look less vibrant. This always kinda bugged me about their coloring, because in-game Mania is clearly going for a bright, saturated look, even if it doesn't match up with the colors/shading in some of the game's official art. Despite this, Mighty and Ray's sprites both match up more with their official renders' coloring than with the style set in-game. Makes 'em feel out-of-place. More useful than having blue spheres there forever, and a way to escape frustration if you're having a bad time with the level you're currently on, but I don't really like it: it's not a good pinball, and you have to spend quite a long time in there to earn goodies, compared to, say, glowing balls where there was also pinball and there were random items too. I usually play pinball plus only for the first two items at most, and usually only enter there if I really need something at that moment, such as an elemental shield. Oh, and rings you grab on pinball itself don't add to your ring count, which is a shame as they only give a symbolic amount of pinball points compared to the rest of the table. Ok, I'm also dissapointed that the Titanic Monarch robot itself wasn't carried further out then what we saw at the end of Metallic Madnes Act adn and the Zone itself. Like.....it needed to DO something. All this setup for a giant robot that ended up never doing anything is strange. Also considering how difficult the special stages were, they should have brought back the Super Emeralds as a reward (and it would have been another neat S&K parallel). The one thing that does bother me, and I really hope they alter if there's ever another patch, is how Encore Mode's Green Hill Zone intro still has the Phantom Ruby in a clump of dirt pulled out by the crane, when it should be in Heavy King's hand, as per the Angel Island Zone cut-scene that preceded it. There was a GHZ Act 2 bug where if you defeated the boss whilst a downwards slope was on the right hand side of the screen, and stood there after breaking the capsule, the character would be unable to run back up it during the cutscene forcing you to reset. Was that fixed for Plus? The first five frames of animation for it are glitched, and not in a way I had expected. Using a quick QuickBMS script I'd written to help me with animation parsing (yeah, I know there's an animation editor being worked on), I found the problem. There's also a bug I spotted in Encore Mode, breaking a swap monitor when frozen doesn't change your current character's sprites until you break free. And also, what's the deal with the tree models in the Special Stage, anyway? The PC version (bottom) had what seemed to be an older, less-detailed version of the model used in the console ports (top), but it seems the Plus version actually downgraded the console versions to match the PC's. Was this intentional, or an oversight? -After you start rolling in the opposite direction that you're facing, you should be able to face the correct way whenever you press forward, but instead you're forced to keep moonrolling. - In Competition Mode, every player has to select a different character from the other players. This was not the case before the update (both players could be Sonic, Tails, or Knuckles if they wanted to be). - The white stripe on Mighty's shoe moves forward when he ducks. Sonic - who has the same ducking animation - does not have this white stripe movement. - In Mighty and Ray's Mirage Saloon Act 1 (in Mania Mode), Knuckles is riding with our heroes before Heavy Magician knocks him off. Mighty/Ray's Mania Mode ending only has Sonic, Mighty, and Ray in it, implying that Knuckles was not part of their adventure. Ergo, Knuckles shouldn't have been riding with them. - In Mighty and Ray's Mania Mode ending, we hear Tails’ tail propellers spinning before our heroes land on the ground. Since Tails is not in Mighty/Ray's Mania Mode ending, we should have heard Ray's glide woosh sound instead. This, please. The different characters aren't evenly matched, which can take the fun out of the races. I'm guess time and budget constraints would make these suggestions impossible, but perhaps they could allow these options via a cheat code (That way, it doesn't matter if it creates new bugs, as it was a cheat). After entering (and exiting) the special stage multiple times, the music cuts out about 5 seconds in. Then the same happens with the zone after exiting and re-entering. Completely exiting the game solves it, but my guess is that it would reoccur after a certain number of times. Y'know I'm pretty sure the devs have a solid enough grasp on the remaining issues with the game but at this point it's pretty obvious you're just going to keep making threads like this no matter what we say, so whatever. I have a strange issue on the PS4 version with time trials that I haven't seen mentioned: In summary, the 'Top 3' times list on individual levels doesn't work/save times at all. If I get a time, it always declares it as a 'New Record', as the comparison time is -'--''--. However, it does record against the Leaderboard, and if I save a replay, I can still prove the time is legitimate, and challenge it. It's not a total lost cause, but it is frustrating having to use Replays instead of a list of times for comparison. 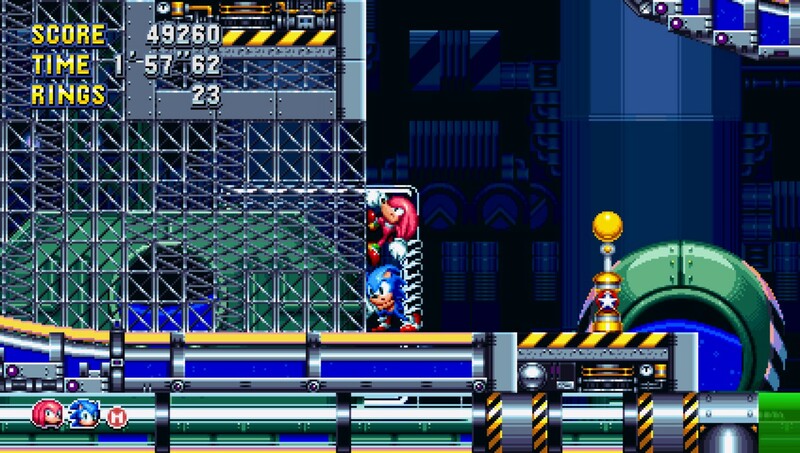 Knuckles can still get stuck in certain walls in Titanic Monarch by gliding and hitting the wall/ceiling at a certain point/angle. This means that Titanic Monarch Zone Act 2's Leaderboard is still a mess, even for Encore Mode, as you just need to get stuck in the wall, and then jump your way up to the Finish Post. Score is no longer saved on save files at all. I quite liked that it was saved beforehand, and you could carry on accumulating it, but I guess it was removed to prevent overflow? Just a guess. You can still skip the initial smoke switch in Oil Ocean Zone Act 2, by standing in the right place at the end of Oil Ocean Zone Act 1. This has the adverse affect of smoke filling the screen over time, but not subtracting your rings. This effect stays until either a switch is pulled, or you reach the boss. I still detest Hydrocity Zone Act 1's linearity in level design. This isn't really a glitch so much as a pet peave (the pattern of hit a switch, ride a bubble past 2 enemies, dodge some spikes, land on safe platform, for example). What's worse is that you can't skip these sections with any sort of skill (like a well timed jump) due to invisible underwater currents (or fans) all over the place; you have to complete them the 'intended' way and they take so long. It feels like it goes against the ideology of Sonic level design and I hate it. There is an actual issue with the last one of these sections though in Hydrocity Zone Act 1: There's a platform you should be able to jump up to, but the ceiling fans push you down slightly and just enough so you can't make it, and have to ride a bubble (why? It's so frustrating). Then, just before you see Eggman swimming underwater, there's a Blastoid on a small platform. However, jumping up to that platform is hindered by more ceiling fans that make your jump feel weighted, and then you land right in front of the Blastoid... and you can bet he'll be firing. So, you have to jump up again and use your invincibility frames to take him out. I really hate this particular part. That's all I can think of for now, but there's definitely some others that I've missed. ...wut. There are so many issues from launch they still haven't fixed. How on earth could they have a 'solid' grasp on them? EDIT: Oh, and while I'm here, I'm pretty sure the insta-shield is still broken. In S3K it extended your hitbox, but in Mania it's either smaller, or it doesn't extend at all. Right now, all it's good for is momentary invincibility, which is awkward because I always used it as an offensive move, not defensive. I think this is a new bug but there's a palette glitch with the Death Egg Robot in the GHZ Act 2 cut scene. 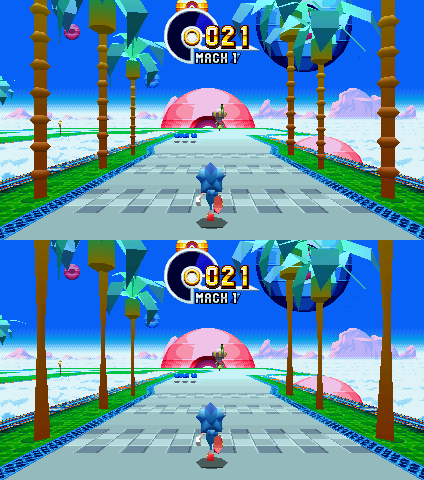 One of the bottom black colors shows as orange in both Encore mode and Mania mode. Also I know it's a palette thing and not a glitch, but isn't there some way to make the HB Gunner in Studiopolis Act 1 Encore blue again? His palette must match the floor which was changed from blue to purple resulting in the heavy becoming purple as well. One glitch which was actually pointed out on the Mania Plus live stream the Sonic account did prior to release involves Ray in the CPZ Act 1 cutscene. If Ray is your partner his tail will move rapidly once your main character completes his intro animation. And not a glitch but just something that I think would be nice, since the game now shows you game completion stats upon clearing a save file, some kind of full game leaderboard would be a nice added bonus. Something that I think has been there since the remakes:-After you start rolling in the opposite direction that you're facing, you should be able to face the correct way whenever you press forward, but instead you're forced to keep moonrolling. 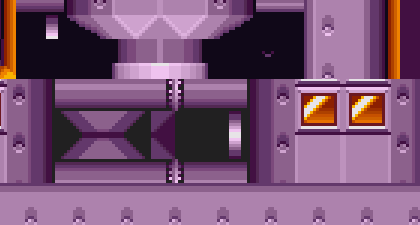 This has been there since the remakes, but I think it doesn't really matter in Mania because changing your roll direction in this way doesn't affect your speed at all, and you can change direction after rolling and jumping, which keeps from starting Ray and Knuckles' double jump moves in an undesired direction. What's worse is that you can't skip these sections with any sort of skill (like a well timed jump) due to invisible underwater currents (or fans) all over the place; you have to complete them the 'intended' way and they take so long. It feels like it goes against the ideology of Sonic level design and I hate it. There is an actual issue with the last one of these sections though in Hydrocity Zone Act 1: There's a platform you should be able to jump up to, but the ceiling fans push you down slightly and just enough so you can't make it, and have to ride a bubble (why? It's so frustrating). There actually is a route in the level you can take that avoids all of these sections. There's one aspect of it that's not exactly intuitive (you have to drop off of the first boat section) but it is otherwise mostly just taking the highest paths IIRC. Oh, and while I'm here, I'm pretty sure the insta-shield is still broken. In S3K it extended your hitbox, but in Mania it's either smaller, or it doesn't extend at all. Right now, all it's good for is momentary invincibility, which is awkward because I always used it as an offensive move, not defensive. It definitely does increase your hitbox; I did a test time attack with the "Max Control" cheat enabled (had to have the dev menu on to do this, but I made sure the time was garbage, no worries ), and at a point when I used the Insta-Shield to defeat an enemy, the replay desynced a little. (The way replays handle desyncs is...interesting btw, if you have the PC version you can easily see how by doing a Peel-Out in a Time Attack and then watching the replay. (But also it shouldn't ever desync under normal circumstances anyway, haha)) The hitbox is definitely smaller, but it does work. Well, it does matter because it's an oversight that can be fixed. I will never understand the backwards ownership complex that many people have with this game.